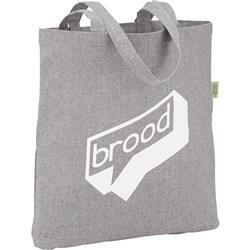 The Recycled Cotton Tote Bag is a truly unique way to show off your brand in a eco-friendly way. The material contains recycled cotton collected from garment cutting waste blended with recycled polyester to produce a strong reusable bag that will surely turn heads. Contains 70 to 80% recycled cotton. 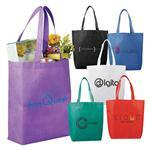 A great eco friendly promotional tote bag. Setup Charges: $50 per color. 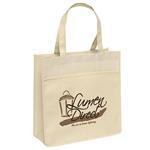 The Recycled Cotton Convention Tote is a truly unique way to show off your brand in a eco-friendly way. 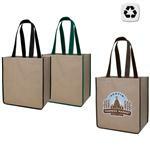 The material contains recycled cotton collected from garment cutting waste blended with recycled polyester to produce a strong reusable bag that will surely turn heads.